Red Paddle Co 10'6" Ride iSUP Paddle Board Review - One of the Best! Summary: The board is comfortable to stand on, as it glides easily through the water. 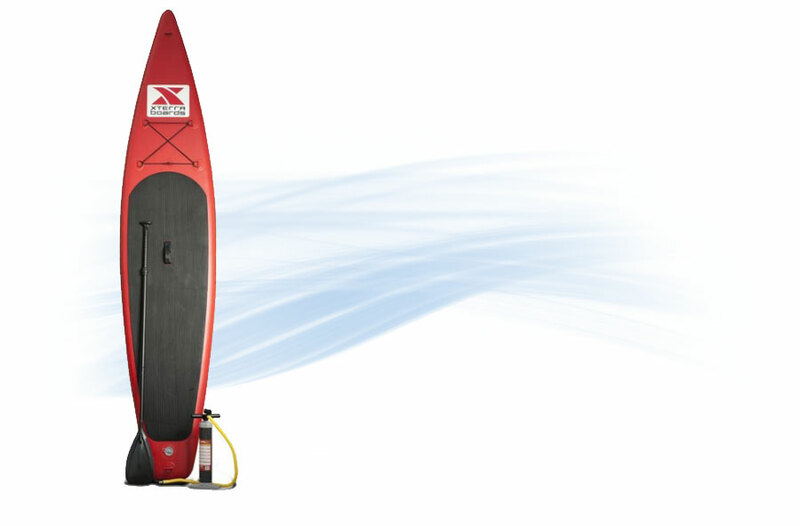 The Red Paddle Inflatable SUP turns quickly and has enough rigidity and rocker motion to champion the surf. Standup paddle boarding (“SUP”) or paddle board surfing began in Hawaii. 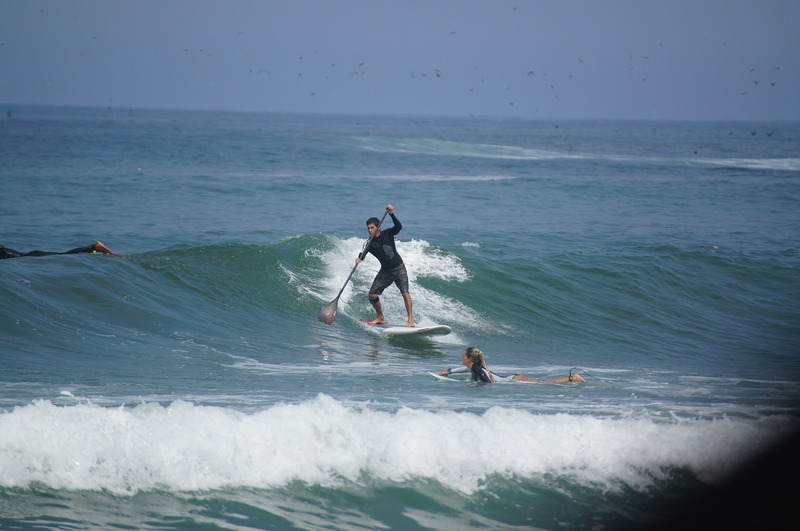 SUPing is a water sport that has gained wide appeal around the world. It consists of a surfing style board and a long paddle. 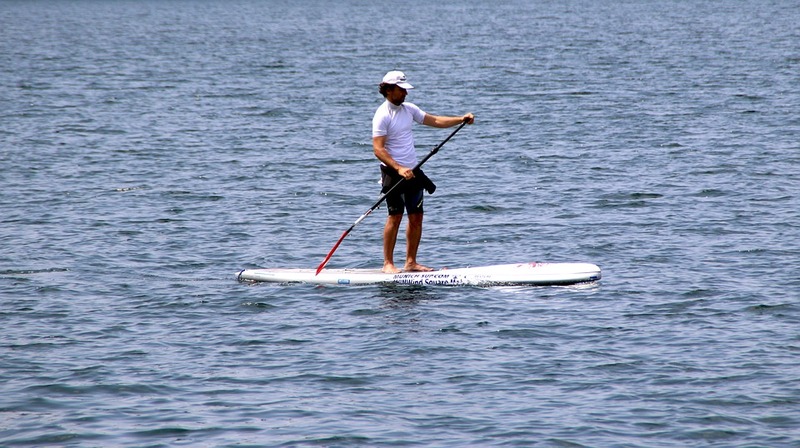 SUP can be performed on any type of water surface. Standup paddle boarding is very similar to surfing, i.e., with a board and SUP is like rafting or canoeing because of the paddling feature. But it can also be enjoyed for simple paddling or paddle surfing. 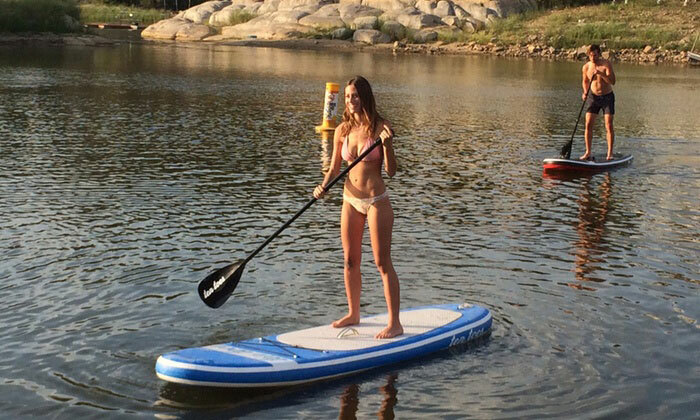 SUP is a great core fitness work out because all your muscles are used. The legs, abs, back, shoulders, and arms workout goes along way as a great cardio vascular workout. Many athletes and fitness gurus enjoy SUP as a great core workout. Yoga is also a new form of exercise, completed on a paddle board. 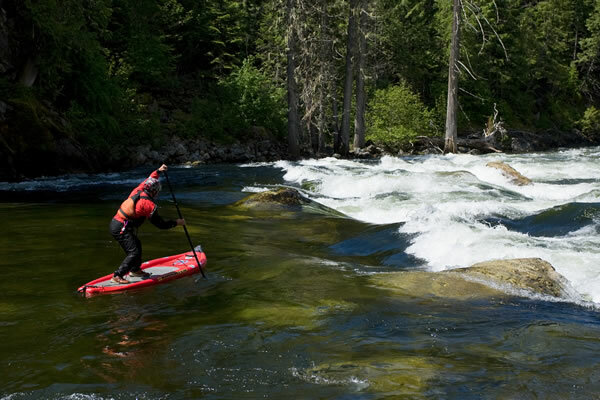 There are also whitewater standup paddle boards, which are inflatable and is used widely in competitions, where it has contestants going through a Class III rapid. The Red Paddle Co RIDE Inflatable SUP is an all around board that is great on most water surfaces. It is stiff and stable enough to help keep you upright for better performance and control. 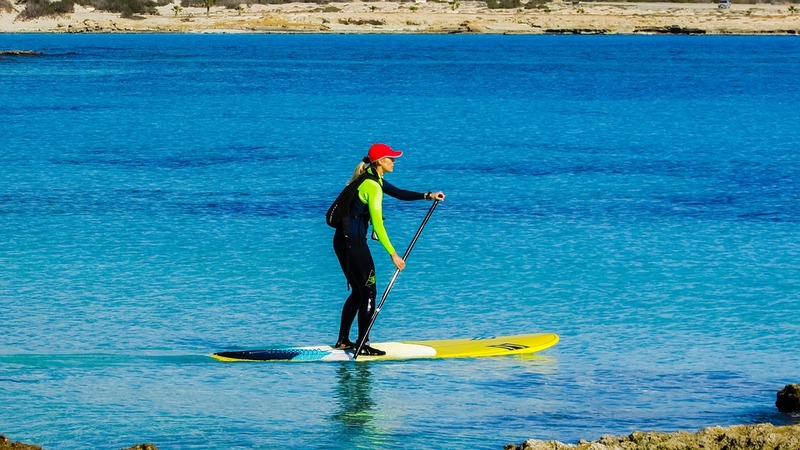 The Red Paddle Co produce some of the best inflatable paddle boards on the market at the moment and are known for their high quality. Not only do you get a top quality board you also get the same great design and top materials in the induced accessories as well, from the bag to the pump. The board is comfortable to stand on, as it glides easily through the water. The Red Paddle Inflatable SUP turns quickly and has enough rigidity and rocker motion to champion the surf. The Red Paddle Co only uses the highest quality drop stitch material which makes the board stiffer than many other boards. Not only does the Red Paddle Co RIDE SUP’s 32” width provides stability, but its 4.72” thickness provides more weight with no flex. The Red Paddle RIDE has three attached fins. The larger fin is great for paddling and the two smaller fins helps it to remain smooth and track pretty straight, both on surfing surfaces and white-water surfaces. Also, what is great about the fins is that they are designed onto the board, you don’t need any tools to put them on the board. 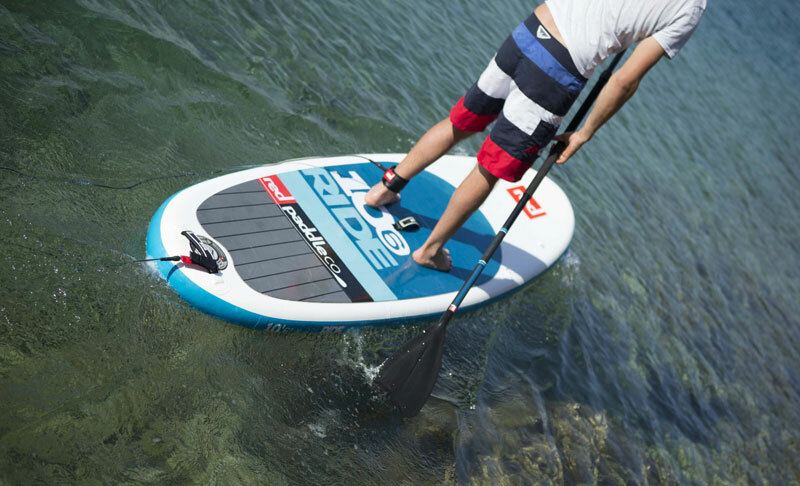 The deck pads on the Red Paddle Co RIDE SUP gives your feet a comfortable environment to stand on. The deck pads are made to be very durable without fear of tearing or being scratched up. There are four cloth D-rings on the front of the board, which allows you to attach your gear. The D-ring at the rear end of the board can be used to attach your pet’s leash and another metal D-ring is located beneath the nose of the board, used for tethering. 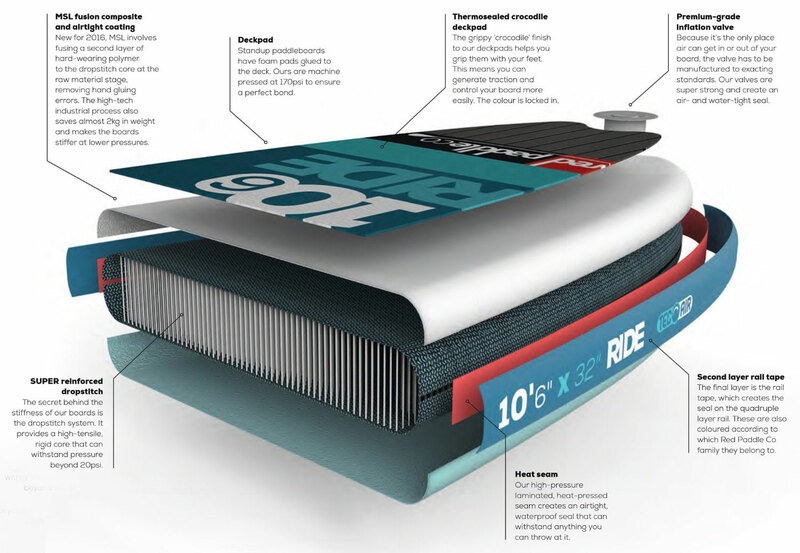 The Red Paddle Co RIDE SUP is made with 4 layers of taping on the rails, making it stronger and puncture proof. The Red Paddle SUP can be inflated up to 25 PSI which is higher than most other stand up paddle boards. This is mainly why the board is so popular, because it can be inflated so high. Most other SUP’s can only be inflated anywhere from 10-16 psi. Also, whatever your water activity is with a paddle board, there is a paddle designed for that event. 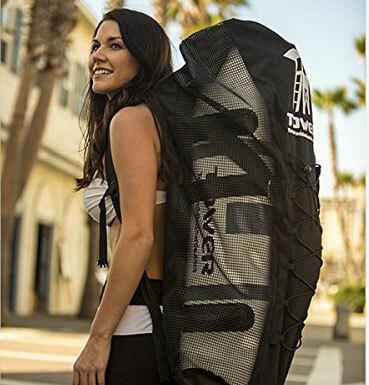 This board is great and the new 2016 model has extra features such as an improved pump and also there is now a bungee cord on the front where you can store your flip flops and gear safely. The Red Paddle Co paddles are designed in carbon, carbon elite, glass, glass nylon and alloy materials. Many paddles are designed to be adjustable. Paddle length will largely depends on the type of paddling you will be enjoying. Generally, a paddle should be 10-12 in. taller than the person if you are racing, 8-10 in. taller if you are cruising on flat water, or 6-8 in. taller than you for surfing. 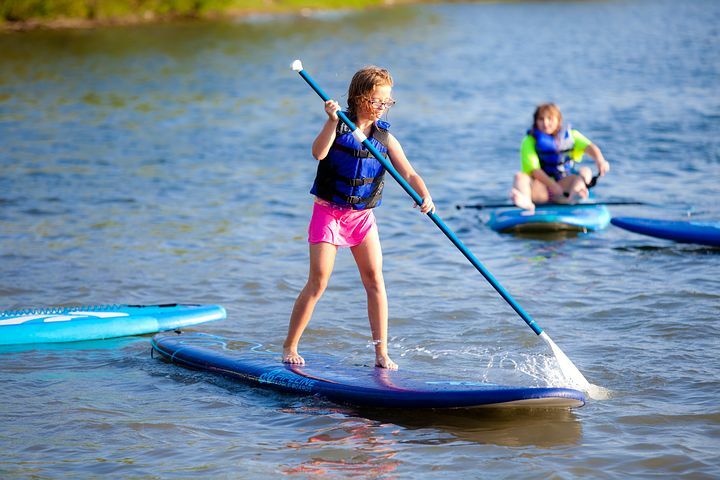 The RIDE stand up inflatable paddle board by Red Paddle Co can be enjoyed in a variety of water activities. This paddle board is very buoyant and with good balance, you can perform yoga exercises as part of a good core training. Many families and individuals like to take their Red Paddle Co RIDE SUP out onto peaceful waters to enjoy Mother Nature and to enjoy the tranquility of everything around you as you paddle along lakes, rivers, creeks etc. 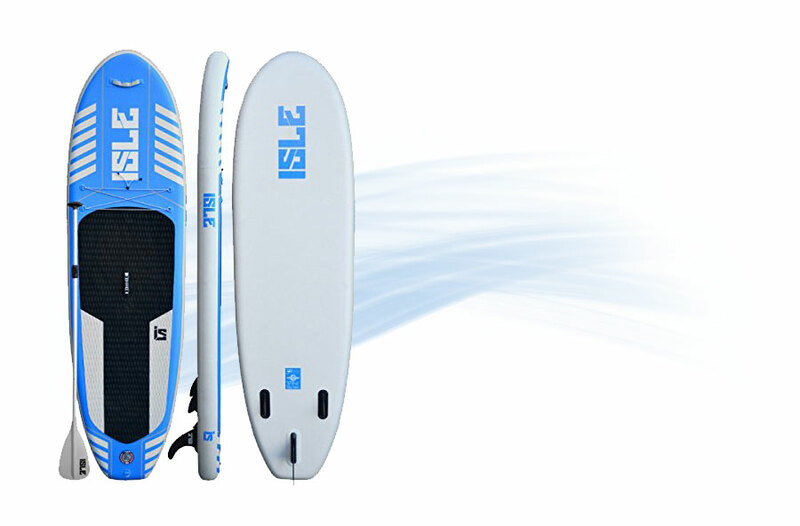 This iSUP can also be taken out on the ocean to ride the waves. SUPing on the Red Paddle RIDE is enjoyable on flat water, sightseeing, racing on varied water surfaces, paddling in river and whitewater rapid conditions and even fishing. This paddle board is very responsive and versatile, it rides very well, it certainly isn’t the quickest but it is a fantastic all rounder and is very stable. can hold up to 220 lbs. 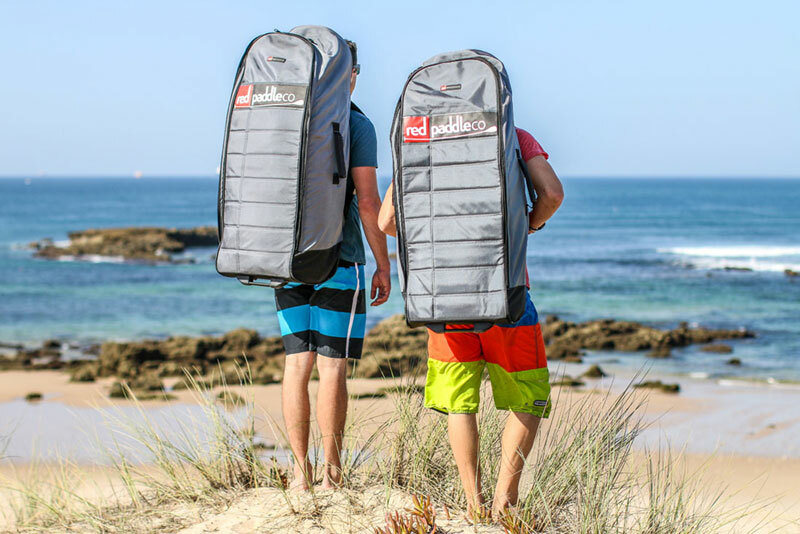 The Red Paddle Co RIDE SUP has a strong and durable backpack carrying bag. The bag has two wheels for easy transport. The carrying bag has padded quality straps, which can be taken off and stored away. The RIDE SUP also comes equipped with a quality high pressure Titan hand pump which is new for 2016. The pump can inflate the Ride SUP up to 20psi. This is one of the best pumps I have used that come as standard with a iSUP board taking just under 5 minutes to fully inflate the paddle board. There are often complaints that once people take their board out of their bag, it is difficult to deflate them and get them back into the bag. Well, not with the Red Paddle RIDE Bag, it deflates easily and easily fits back into this sturdy bag, as well as the pump and paddle. The bag also has wheels to the bottom allowing you to move it round like a suitcase, this really is a well designed bag and is well built too, not only do you get a great board but you also get a great bag too. It can be pulled along on smooth surfaces or carried as a back pack, which although my be hefty when filled it is comfortable on the shoulders. Additionally, the Red Paddle Co RIDE SUP contains a dependable repair kit and an instructional manual as well as a water proof phone case too. Again all these little extras are great additions and are also high quality, with other boards you get some ‘free’ extras but they come across cheap, not here, the same quality is maintained throughout, from board to all the extras. 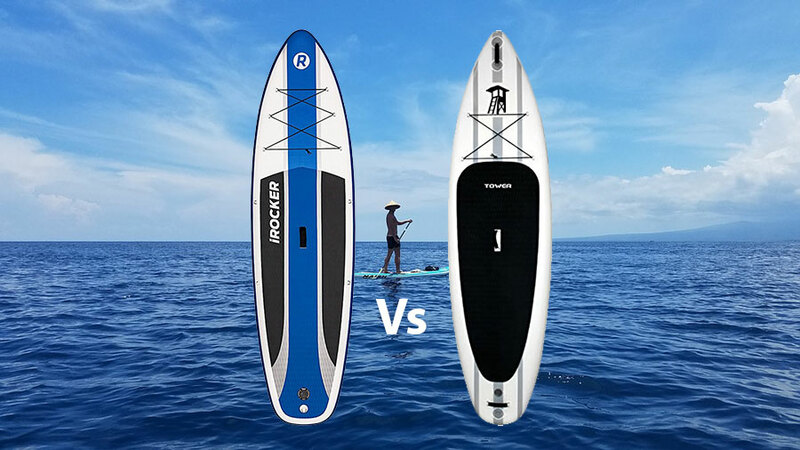 The Red Paddle Co RIDE SUP is such a worldwide popular inflatable board, its pros are many and its cons seem to be a stretch in trying to find anything wrong. 2016 model has a bungee cord on the front which is great. Comes with a very sturdy well designed bag. The deck is comfortable under your feet and the board is ‘forgiving’ if anyone – adult or child were to fall on it. No paddles included in this package, would be great of they were. Slightly heavy, but it is the best there is! 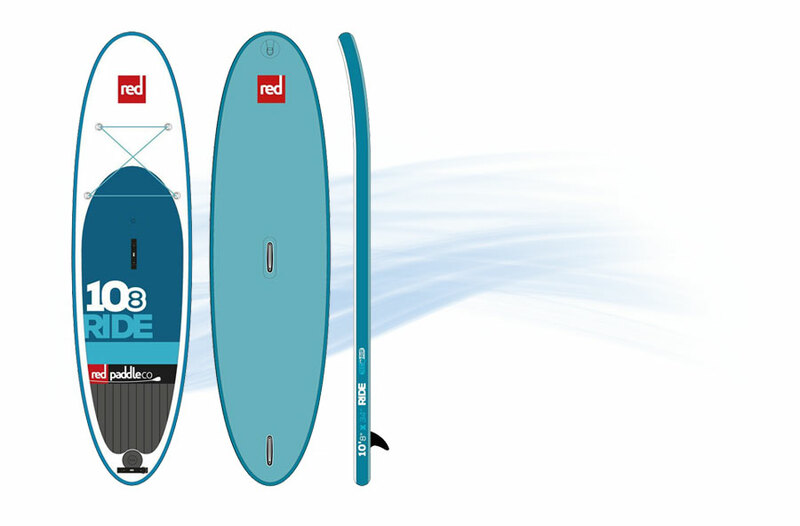 The below table compares the 10′ 6″ board with the rest of the Red Paddle Co RIDE SUP range, including the Red Paddle Co Ride 9’8” and the Red Paddle Co Ride 10’8”. 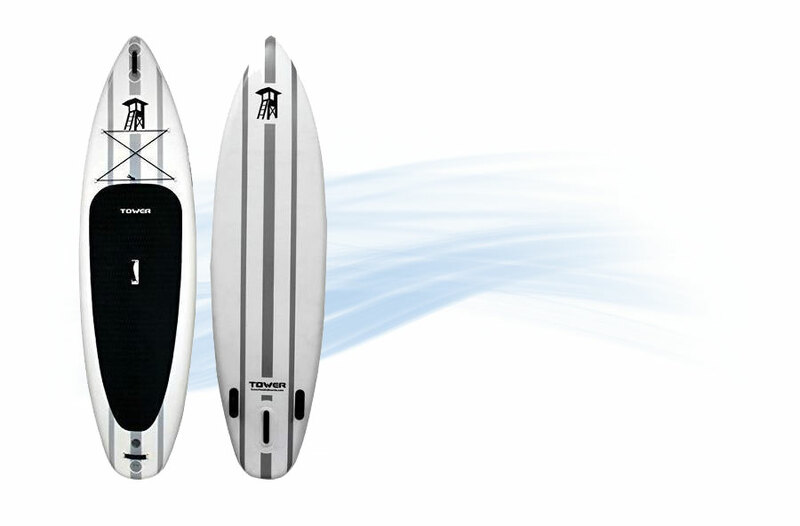 Length 9' 8" 10' 6" 10'8"
How does this board perform in surf conditions? 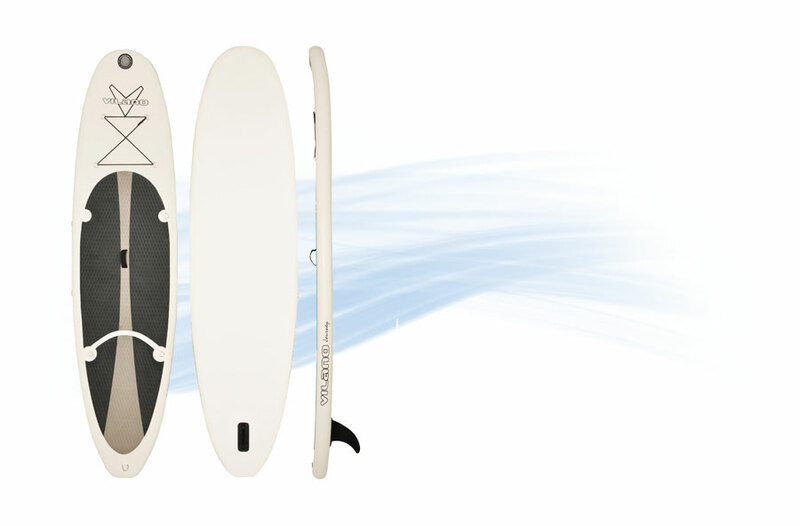 This 10’6″ board is ideal with smallish waves however and handles well on flowing rivers. Can I leave the Red Paddle Ride 10’6″ inflated? Yes you can, the manufacturer Red Paddle Co recommends that you store your board out of direct sunlight, and you should reduce the PSI to 15if you don’t intend to use it for a while. What comes with the included repair kit? The Red Paddle Co Ride 10’6″ repair kit includes patches, glue, and a valve tool. Can my dog join me on the board? Absolutely. They will love it as much as you will and with the strong durable construction and materials of this board no damage will be caused. If you want the best in waterboarding, strength, durability and quality, then yes, we certainly recommend the The Red Paddle Co RIDE SUP. They are priced competitively and will last for many many years. The Red Paddle RIDE SUP can be paddled on nearly every water surface and the Ride model comes in a range of sizes, so depending on your size, weight and how you wish to use it then this board is ideal with sizes to suit all. Made from 120mm droptstitch PVC material this is a fantastic all round paddle board, it is certainly one of the best made out there and is very strong, robust and durable. It not only looks the part it also performs making it ideal for all types of water be it still or waves. 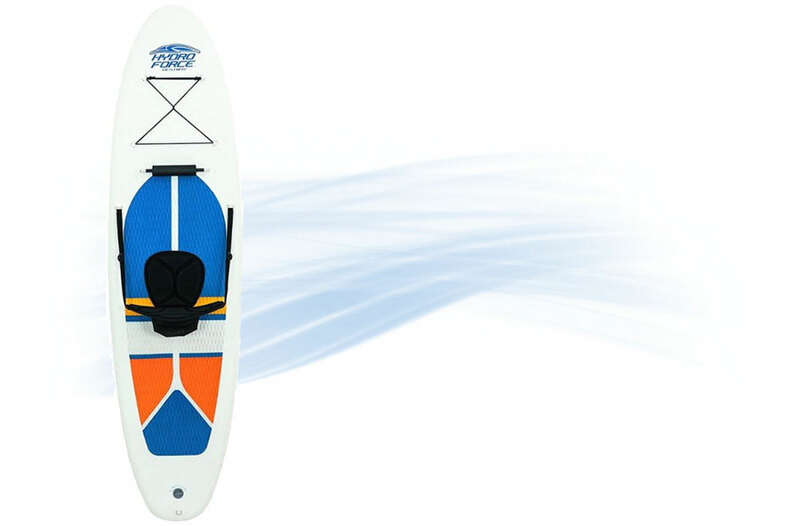 The 10’6 Ride is smooth and easy to manoeuvre on the water and is a great investment. If you are looking for an inflatable paddle board we can’t fault this one! Really, this is a great board from a great SUP company. If you are looking for a first board or a new board this should be on your shortlist.